A personal fashion rule of mine is to never wear a monochrome outfit. I can wear a black dress with black tights and black shoes, and not to mention my black hair, but I have to have at least 1 vibrant colour on me. For me, the idea of an all-black outfit as edgy is quite overblown, especially now that it’s winter and everyone’s expected to look as glum as the sky. This GAOP is a typical winter look of mine. 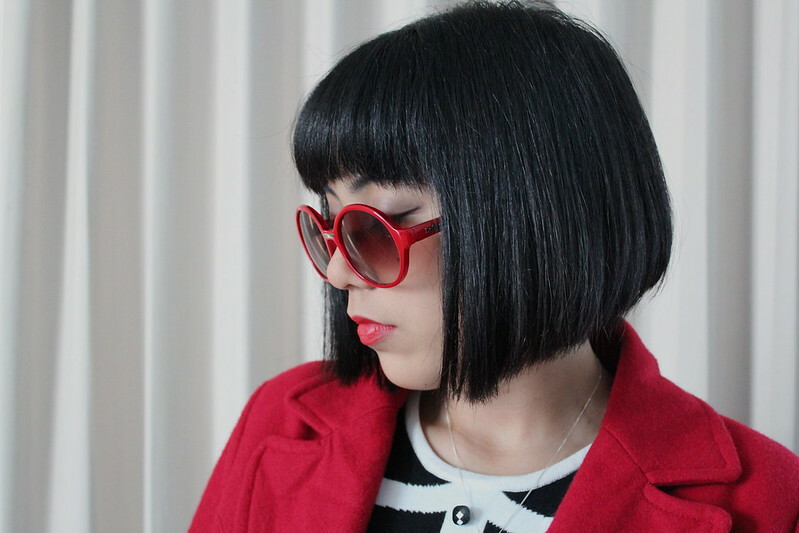 Black and white dress + tights + kitten heels + red sunglasses and coat, my 2 statement pieces. Hold on, let me take off the coat to show you the dress’ detail. The print is like a variation of a tuxedo outline, with real buttons to add dimension. To be honest I prefer this one because it’s less common. Also, because it’s a cross between a French maid uniform and business casual dress, which is SUPA KAWAII if you ask me. Another aspect of my personal style that shows through in this outfit is how I balance out a body con dress with something slightly baggy. Not only does this add character, but it also makes the outfit comfortable enough to sleep in.